There's a holy grail in Music production - being able to use an ASIO audio interface on Pro Tools Native, at such a low buffer that it won't need to have DSP in order to be able to perform overdubs and do tracking through Pro Tools. In post-production though, the imperatives are different. There is less need to have to drop buffer sizes for mixing, though of course there is the case of recording voice-over or ADR, as with the track counts and live plug-in counts we get, often the host computer needs as much help as it can get to all the audio out, at the right time, in sync with the picture. There is an alternative to upping your buffer size though. What you can do is make sure that all forms of data transfer are as efficient as possible. This means having lots of high-speed multi "channel" RAM, Co-processors (GPU) to take the load off the CPU, very fast disk access speed - at least SATA3 SSDs, and your audio interface connected in such a way as it has Direct Memory Access (DMA) to the CPU, so using PCIe, or its hot-pluggable equivalent - Thunderbolt. Basically, you're giving Pro Tools room to breathe and ensuring that it doesn't have to waste time "disk swapping" data to and from your RAM and SSD, plus making sure that when it comes to outputting audio to the interface, there is no "congestion" on the way. Much like with your cardiovascular system, "data congestion" can be fatal to your Pro Tools session. A lot has already been said about the PreSonus Quantum, in both James' review in a music environment and in the shootout between it and the Merging Technologies Hapi, but not a lot has been said about using it in a post-production environment or indeed using more than one Quantum at a time. There is an instant advantage with using the Quantum for post-production, as it has ten balanced analogue outputs (7.1.2), which can all be ganged together by the front panel gain control. This is perfect for a "Home Atmos" installation, to enable 7.1.2 sound design and premix, all through just one interface, with a built-in hardware volume control. Taking full advantage of Thunderbolt's Direct Memory Access, the Quantum is able to get up to 32 outputs out of Pro Tools Native at low buffer settings, with the minimum of fuss. Say you were a post-production facility that also had voice-over / ADR recording facilities. You'd be able to easily switch between recording and mixing operations without having to faff about with changing the buffer settings or relying on external DSP to provide foldback to the artist. This is all about minimising time wasted - your time costs money, but then so does the artist's - they can get very uncooperative if they're delayed! 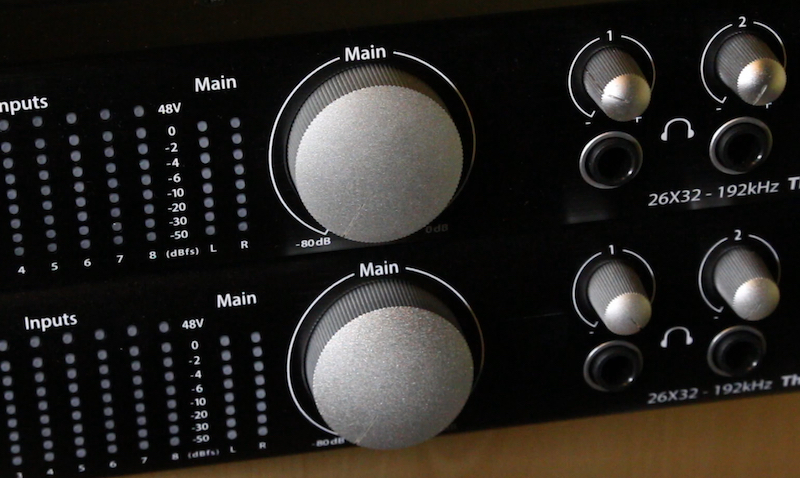 There's very little to dislike about the PreSonus Quantum. Installation is remarkably easy and I've had no crashes whatsoever. The interfaces are even hot-pluggable on Windows. The iOS and Android Universal Control apps work seamlessly and give you all the control you have in the Windows version, giving you easy access to input gains, talkback, dim and master analogue output gain ganging, even if you do not have enough screen real estate to have the desktop app open at the same time as Pro Tools. ProTools remains really responsive, even at low buffer levels and this interface offers a glimpse of being able to work truly "in the box", both mixing and recording, without dedicated DSP. The only problem is with Avid's own software limitation with IO. Avid will not allow Pro Tools HD Native to output to more than 32 channels of IO. Even if you delete outputs on the first Quantum in IO Setup, Pro Tools will still not allow you to output audio to physical outputs higher up than 32. It's faintly ridiculous in this day and age that Pro Tools HD Standalone cannot work with more than 32 channels of IO and is limited to 256 tracks. Let's hope that Avid have a nice suprise in store for us at NAMM! While it is possible to gang all the analogue outputs on a single Quantum using the front panel Main gain control, it is not possible to gang more than one. When mixing in surround or immersive audio, it is vitally important that you can calibrate your monitoring level and control it across all your outputs, even digital. Unfortunately, the Main gain control is not a "soft" control, so you get no feedback as to the level and you get no individual trim control over each of the analogue outputs. This is compounded by the fact that PreSonus have not printed any graduations around the Main gain control, so it's very difficult to set your calibrated monitoring level without resorting to the old tried and tested chinagraph method. For me using in a Post-Production environment, the issues with the Master Gain control are the only fly in the ointment in an otherwise excellent specification and value for money package. It has been 100% reliable and a breeze to install. PreSonus have absolutely done their homework with Thunderbolt on WIndows and the instructions fully prepare you for any potential pitfalls. It's great to see a pro audio manufacturer being truly cross-platform, by supporting Windows, Macs, iOS and Android devices. The PreSonus Quantum retails at around £1000 in the UK. While there are cascadable Thunderbolt interfaces with more features such as DSP available, they are a whole lot more expensive. If the issues I have are not an issue for your workflow, I would thoroughly recommend considering the PreSonus Quantum as your next interface.